This short tutorial will help you to setup your Blogger domain name with your Network Solutions account. Log in to your account at the Network Solutions Account Management. After logging in, click on My domain names as seen below. A list of all your domains will be seen, click on the Manage option next to your desired domain. Next, your current settings of the domain will be displayed as shown below. To edit the DNS settings, click on Edit. Click on Edit A records, and enter the values shown below. Add the following IP addresses to the Numeric IP field. Now, click on ‘Continue’ to save the A records, and go back to the ‘Domain Names’ menu in the Account Manager. Select Edit CNAME records to edit the CNAME records of your domain. The DNS settings of your Domain have now been re-configured for your Blogger.com domain. Note that, it might take time for the changes to take effect depending on the TTL (Time-To-Live) that you have specified. 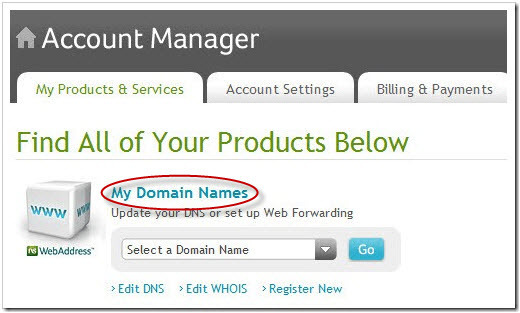 After that you can setup custom domain name in your Blogger.com blog URL. This helped me, thanks for the awesome post. Not sure what I’m doing wrong, but i did all these steps and it keeps giving me an error on the CNAME step saying ” an A record already exists using that alias ” do you know what I may need to do to fix this? If you already added A record with WWW alias, then remove that from A record section. And then try to add WWW in CNAME section with ghs.google.com. Note: the 4 IP addresses should point to your A record section. I tried what you said to do (remove that from A record section.) but that only leaves 3 IP addresses will that still work? You need to add 4 IP addresses in A record section and www = ghs.google.com in CNAME record. Made the recommended changes. Still can’t host the domains. GoDaddy domains require a few steps. NS charges for domain forwarding, which is mainly the reason I intend to move these domains. The cname errors keeps turning up. I followed your instructions. Let me know. Thanks. I was able to make the changes on another NS domain. It worked. I will model the changes to try the other domain again. Thanks for your help. Your article is much better than another located underneath yours in Google. In my opinion, your images are extremely helpful. Thanks again. You need to add WWW record in domain registrar as well. thank you for your reply, I did waht you said but it dosen’t work, ca you please check this image and tell me what is wrong. @ Nitun, can you please help me to setup my domain? can anybody help me please ? 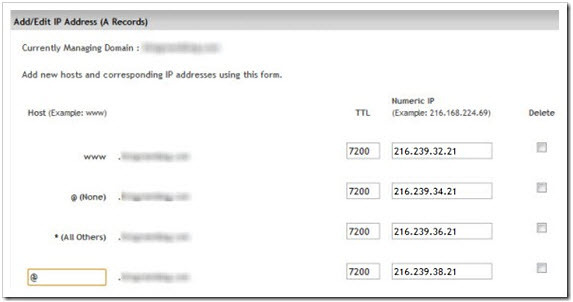 remove www from A record and for * (wildcard) add IP address. It will work fine. If you are having admin account with network solution then there must be an option to do the changes. Otherwise you need to get in touch with Network solution support team. Oh, sorry to hear that. If Network solution is not giving you proper support, then you can move away from there service. We have a better domain/hosting service http://dh.rtcamp.com/. You can hire us for this task. Contact me from here and send me details. My team can do the needful thing. As blogger.com changed the value of CNAME and we need to add some string for WWW values. In your case please get in touch with Network solution support team. Generally values for CNAME records either proper domain or @ Symbol. I think they might have added some validation rules for CNAME records, hence you are not able to add it. Blogger.com provide us one extra CNAME record and yes which is too long string, In this case you need to contact NetworkSolution team and show them URL or article, then will help you on this. I have already contacted them two times. But no reply yet. Yes, I am aware of Network solutions policies and many problem faced by people. You can transfer your domain to other domain registrar where you will get good support and other free services. You can check our own domain registrar here (http://dh.rtcamp.com/). If you need any help for domain transfer, you can email me nitun.lanjewar@rtcamp.com . Your tutorial help so much on setup for blog. This is totally helpful except I didn’t need the ghs in CNMAE as the IP was put in A records. Thank u a million! I was having difficulties with network solutions after an hour of startup! Now it’s the waiting game to set my domain to blogger. Quick question @ Nitun Lanjewar how long do I need to wait to set blogger to my domain?